Mobile Fidelity Sound Lab has been the undisputed pioneer and leader in audiophile recordings since the company's inception in 1977. Established by dedicated audiophiles, Mobile Fidelity's first and foremost goal was to offer faithfully reproduced high fidelity recordings that would compliment the numerous advances occurring in audio delivery systems. Throughout its history, Mobile Fidelity has remained true to this goal, pioneering state-of-the-art technologies and setting audiophile standards that remain in place today. This is a true Collector’s find for those individuals who want to own the finest and rarest pieces of musical history. It is similar to owning the artist’s own Rare Gold Record Album in a Gold CD pressing. You will be one of the last people in the world to own these Limited Edition Long Out of Print Masterpieces that will add true value to your Collection. MFSL LIMITED GOLD EDITION. This 24-Karat Gold Limited Edition is an audiophile collectors item that simply gives the feeling of being directly in the studio with the artist. This recording is mastered from the Original Session Tapes and the disc is custom pressed using 24-Karat Gold (known for its superior qualities and resistance to oxidation). This Out of Print Gold bonafide collectible disc has all Liner Notes, Photos, and Artwork from the Original LP faithfully recreated. A SONIC WORK OF ART. These Out of Print gems are the Ferrari of the audiophile CD market. Many over the last year have doubled or tripled in value. The future of these collectibles is so exciting because each piece is a sonic work of art that will never be reproduced using this expensive 24-Karat Gold mastering process. You will be one of only a few thousand in the world owning this audiophile classic. Original score composed and performed by Vangelis. Recorded at Nemo Studios, London, England. While only serious film buffs are likely to recall Hugh Hudson's role as the director of the Oscar-winning CHARIOTS OF FIRE, the Greek composer Vangelis became, and remained, a household name with his soundtrack for the 1981 film. At the time, the theme song was parodied as being excessively saccharin. Indeed, with titles such as "Five Rings" and "100 Metres," the album wears its Olympian heart on its sleeve. 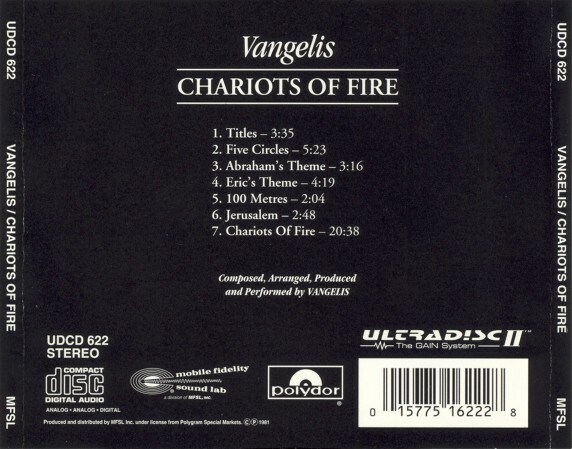 Nonetheless, CHARIOTS OF FIRE is often a brooding work, and if the prevailing memory of this album is one of slow-motion runners and heady triumph, Vangelis's synthesizer work often conveys a sense of isolation and lost glory. Listening! You can hear a difference! Enjoy it!